The Gurkhas get to see first hand the destruction left behind. 25th April 2017 marks two years from the first earthquake that hit Nepal and gives an opportunity to reflect on the contribution of the Brigade of Gurkhas. The worst earthquake to hit Nepal for 80 years was followed by a second earthquake two weeks later on 12th May 2015. In those devastating weeks 8,891 people were killed, more than 22,300 injured, more than 893,000 homes were destroyed or damaged, as well as schools, clinics, temples and ancient buildings. The disaster affected 8.1 million people, many living in remote and mountainous areas of the country. The Brigade of Gurkhas was able to provide support for its own people in its own country. 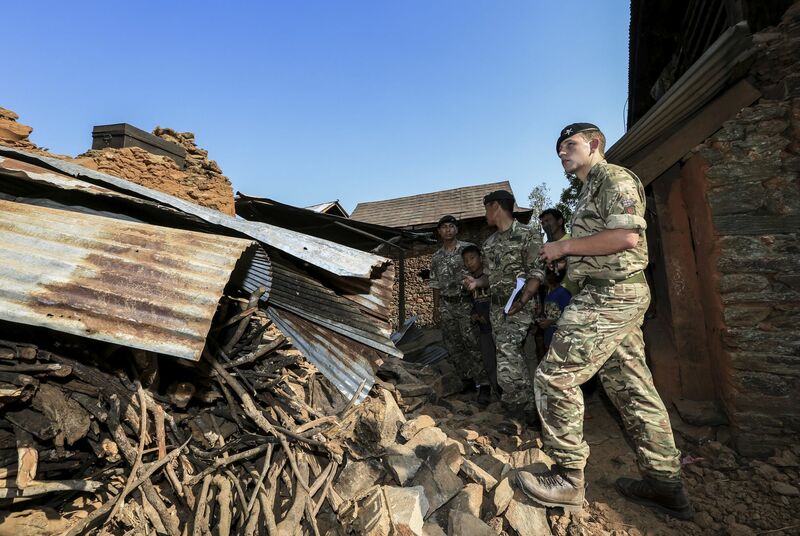 A small team consisting of soldiers from 2 Royal Gurkha Rifles (RGR) and Queen’s Gurkha Engineers (QGE) were dispatched within days of the first earthquake and were able to provide immediate assistance and relief. At the time of the first earthquake the main body of our Everest Team had just reached Camp 1. They were able to help save the lives of those stranded there and manage their evacuation whilst the remainder of the team, who were still at Base Camp, miraculously survived a huge avalanche which left devastation and killed many. The Everest team then moved back to Kathmandu and were able to provide additional assistance. At the same time our serving Gurkhas based in Nepal, as part of British Gurkhas Nepal, were the focal point for the UK aid for British citizens, assisting with food and shelter and later evacuation while also coordinating the emergency aid and assistance being delivered from UK. At the same time the Gurkha Welfare Trust was providing situational awareness from its Area Welfare Centres across Nepal and immediate support to those affected. Personnel from 1 Royal Gurkha Rifles (RGR) deployed to Pokhara in West Nepal to assist the Gurkha Welfare Trust (GWT) in running an Operations Room and helping with reporting updates back to Kathmandu and UK. For the last 18 months four deployments of Gurkhas, based on QGE but with representation from all cap badges, have deployed to Nepal to assist with the rebuilding of houses and schools damaged by the earthquake. And finally serving Gurkha units raised over £500,000 for dealing with the aftermath of the earthquakes and the Disasters Emergency Committee raised over £86M – the largest figure raised for a worldwide disaster; such is the special place of Nepal in the hearts of the UK public.